Class editing, 3D Model, FMD & EMD files by Flakiten. If I forgot someone let me know. a). 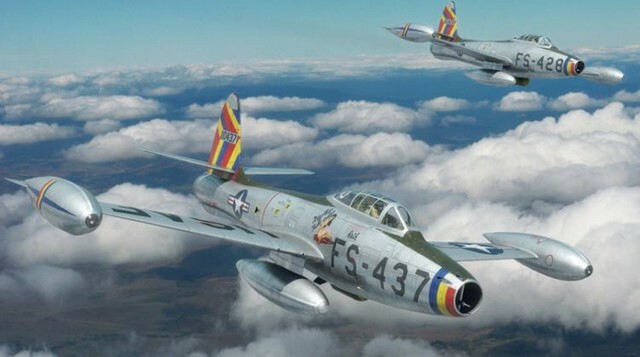 See [PaintSchemes] folder to know the name of the F-84´s skin folders. b). Only the G2 model has Jet Assited Take Off. c). Don´t land with fuel drop tanks loaded, you can explode. d). Also can happen if you try to land with heavy loads. Go to land clean, it´s good for your health. e ) You must have a long (very long) runway to take-off. YES! I have been waiting for this for a long time and this is a GREAT gift to us! I thank you and your team very much for this add-on aircraft. All of you you rock! "Have a good time, all the time"
Thanks Flak! JATO rockets are a blast. What a fun Jet TY. Hi Flak! Thanx a bunch for this!!! What a great start to the weekend!! For plane and new cockpit ! Boy 'o boy! Thank you for a job well done. Strictly four-oh! Now if I can just figure out how to use the JATOs. Strictly four-oh! Now if I can just figure out how to use the JATOs. and the JATOs turn on automatically. Check the ammo panel, the trim at autopilot, the fuel selector with drop tanks, etc. Thanks Flak, figured it out. You've done a wonderful job.